A few of you have asked me about how to dress for your shape, how to figure out your shape and what to wear to accentuate certain body parts. Well, it has taken me a reason to address this because I am on the fence with this, always encouraging one to find out what works for them and not to prescribe to more rules and in the box thinking, HOWEVER, the other part of me realizes how important it is to know what you are working with to better identify what pieces you will OWN based on your comfort level… so with that in mind, I wanted to chat a bit about dressing for your shape as a plus size woman, with the help of the Igigi Shape Stylist! Interestingly enough, I received this cool infographic from Igigi and had pinned that sucker, but I wasn’t ready for the reception… you LOVED THIS. And so, I thought I would take this pin (are you following me on Pinterest?) and share it here, so that you had a fun little reference point to play with. Rather than reinvent the wheel, why not share a tool that I have found (and you have found helpful as well) quite detailed to help you along your shopping journey. See why I thought this was amazing? Now, some of the feedback I had received from this was that “they all look the same” or “I do not know how to find my shape” well, no worries because Igigi was not going to drop this without helping you figure life out! Check out the Shape Stylist, an online tool that helps you identify your shape and then gives you fit suggestions AND shares with you the dresses that will cater to you! 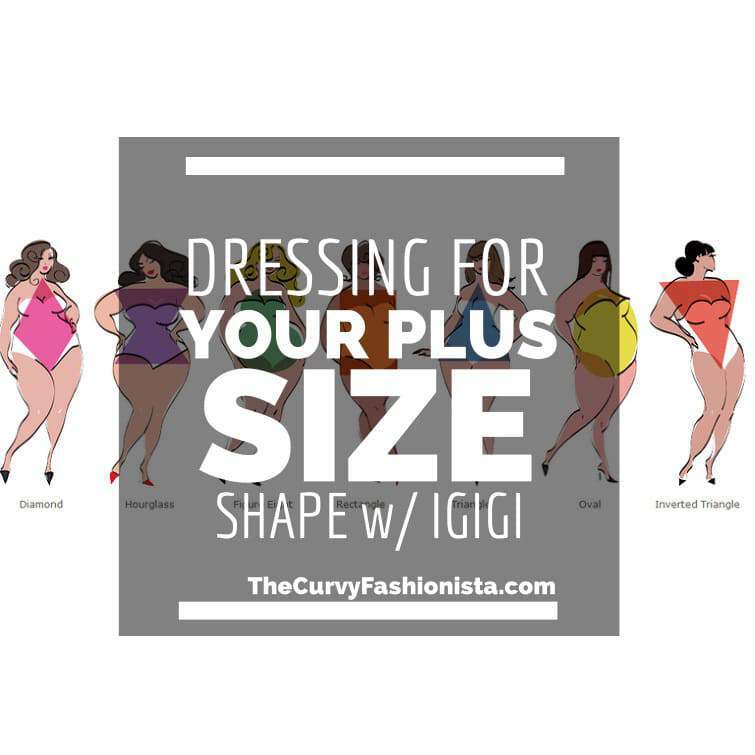 Make sure you check out Igigi and the Igigi Shape Stylist to learn more about dressing for your shape as a plus size woman! I am in between an hourglass and a figure 8. These days I think I am more of a figure eight and an inverted triangle than not… BUT, the key here is that I know my shape and have played with enough silhouettes that I know what will work for me and what I will feel comfortable in. I do NOT let it box me in, but I do know which cuts of pants will draw the most attention to this or that, the types of tops I prefer to rock with, and the shapes of dresses that play up the assets the best. For example, I love a great bodycon dress and since I have a defined waist and not the most pronounced hips, I do not mind the fitted feel. However I love my legs and have been playing around with this defined waist dresses and skirts, and what do you know? I dig it! Skinny jeans do not raise fear inside me, and wide leg jeans are my friend… how it is all put together is what matters here! What about you? Do you know your shape? Does this photo help you out a little bit? Do you subscribe to this? Let’s talk about it, after you share this with your girls!